I'm back today, to share another one of the layouts I created as a Guest Designer for Blinks of Life, using the October Kits! I really loved working with the Sugar & Spice and Cinnamon Roll kits, and it was fun to see all of the the different looks that could be created, from mixing the kits! 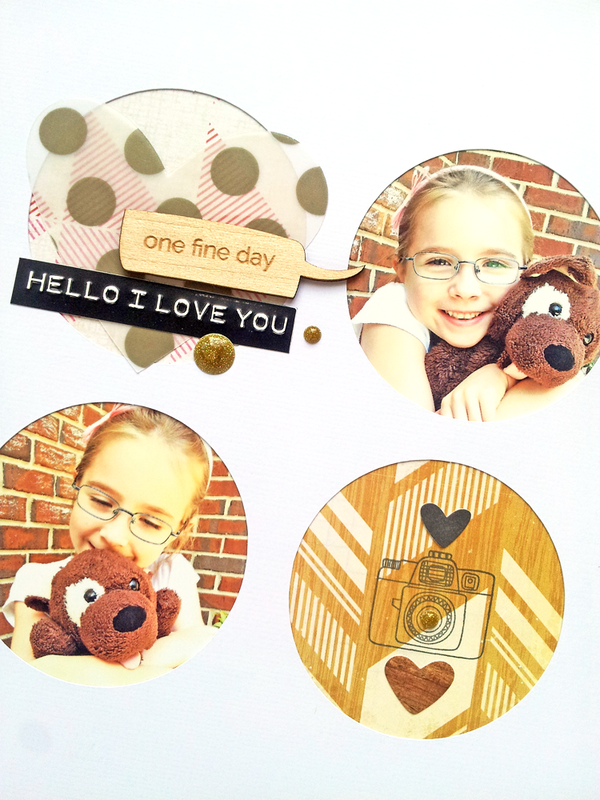 I went with a more clean and simple look on this layout, because I really wanted the focus to be on the cute photos of my daughter with her stuffed animal best friend, Fudge! I cut the circles and then backed them with some of the different patterned papers included in the Sugar & Spice kit and added my photos in the other spaces. I also wanted to include the awesome vellum paper with the Gold polka dots, so I cut some heart shapes and adhered them to three of the circle areas. I finished my layout, by embellishing with some of the cute wood veneers and cork pieces included in the Kits, and adding my title with the October Afternoon letter stickers. If you haven't had a chance to stop by Blinks of Life, make sure you visit the Blog and Gallery! There are some stunning projects in the Member Gallery, and you can set up your own gallery for uploading your projects!